— Unlimited Tabs: I’ve had over 20 tabs open at once in Chrome and the app has still performed well. — Swipe through tabs: It’s easy to move quickly through your tabs by just swiping left to right (or vice versa) – and you can tap, hold, and drag to move tabs around. — The Omnibox: One of the star features of Chrome on the desktop – you can type a web address or a search term into the all-purpose omnibox. Whenever I have to use Safari I miss this big time. — Voice dictation right in the Omnibox. This makes it even easier to use your voice for search or entering web addresses. 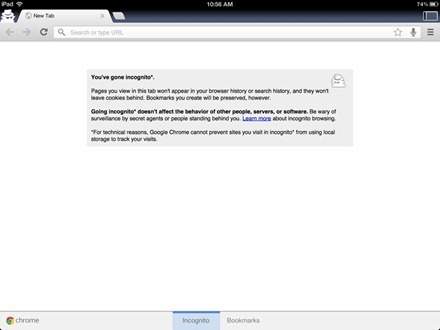 — Privacy Features: With a single tap at the top right of the Chrome screen you can open an Incognito tab. When using these tabs the pages you view won’t appear in your browser or search history, and they won’t leave cookies behind. You can also clear browsing history, cache, and cookies right from within the app – rather than having to do this in the Settings app. — Chrome has a Save Passwords feature that can be toggled on and off in its settings. 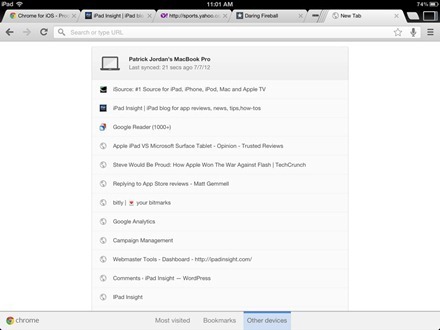 — Best of all, if you’re a Chrome user on the desktop, you can sync open tabs, bookmarks, passwords and more from your PC to your iPad. 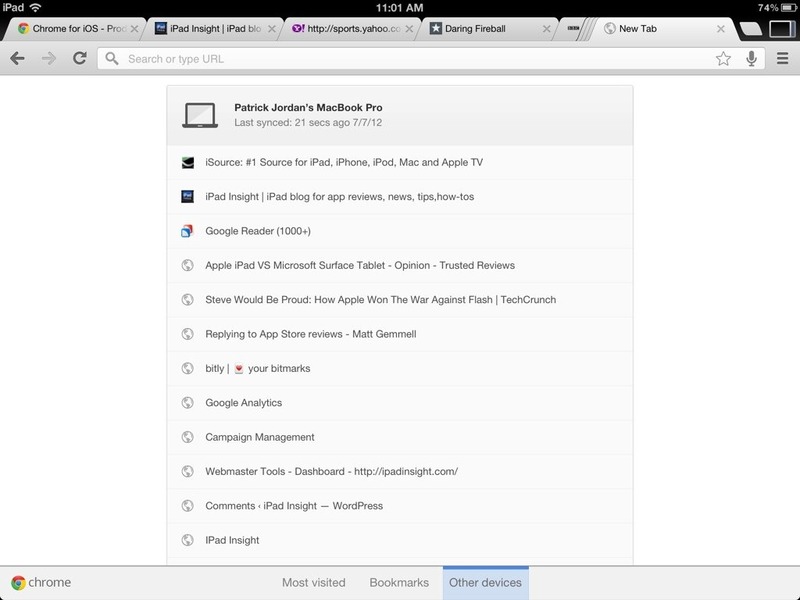 To see it in action on the iPad check out my recent screencast demo of Chrome on iPad on YouTube. Here’s an App Store link for Chrome. If you’re after more great free iPad apps, be sure to check out our previous choices for Best Free iPad of the Week. We’ve been doing these for over a year now. 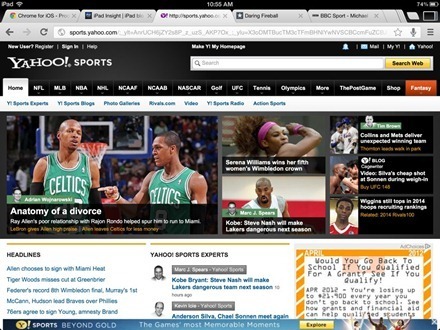 Make sure you are signed in on both the iPad and Chrome on the desktop. Look under the Chrome menu on the desktop to confirm you’re signed in. If you opened the iPad app before being signed in on the desktop then you may need to manually quit the app on the iPad and reopen it in order for it to see your desktop open tabs etc. google chrome all the way. Can not beat it.